Concepts of gravity and levity informed Feilden Clegg Bradley Studios’ steel-framed design for the Isaac Newton Academy in Ilford, east London, a 1,250-pupil school specialising in maths and music. 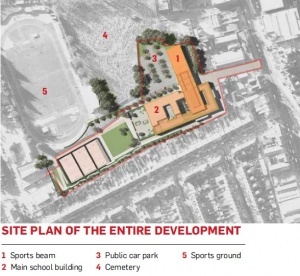 The narrow site was tightly constrained by a cemetery, terraced housing and a Redbridge Council-owned car park, which had to remain operational during and after construction. The brief specified 11,700m2 of accommodation, but building high to compensate for the small footprint was not an option because of height restrictions owing to the proximity of the housing. An added complication was the organisation of the school into effectively four separate year stages (key stage 3 A and B; key stage 4; key stage 5), each with its own entrance/reception and outdoor play area. Faced with the prospect of providing a deep block without the quality of natural light and outdoor spaces they wanted, the architects took the risky step of instead proposing a double-height “sports beam”, projecting 55.8m out of the main building beyond the school’s original site boundaries and over the car park, supported on two-storey steel columns. 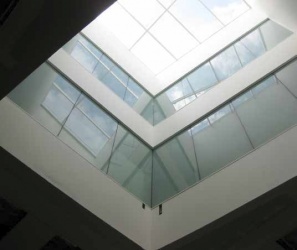 This strategy allowed the architects to provide the other school facilities in an interlocking four-storey main block, permeated with outdoor space in the form of courtyards and roof spaces. According to the practice, the massing of the two elements was also partly a response to the work of Isaac Newton. “There is the idea of levity versus gravity with the two volumes,” explains studio leader/partner Andy Theobald. “One, a heavy brick block with most of the accommodation; and the other, a metal box hovering over the car park providing the levity.” These two concepts could also suggest that the academy is both rooted and aspirational, says the design team. 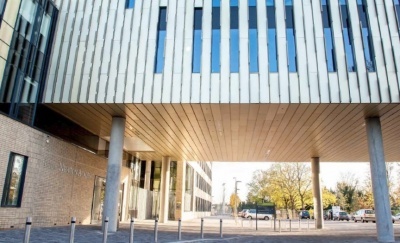 According to engineer Hardip Bansal, a steel structure was chosen for construction speed and because it suited the long spans of the sports beam, as well as the complexities of working over an operational car park. The lack of structural continuity throughout the main building precluded a reinforced concrete flat slab solution. This primary structure was combined with exposed precast concrete floor slabs and highly insulated SIPS panels clad with buff brick on the elevations. These brick slips were used clearly by the architects as tile-like cladding rather than as a tectonic element, with the width of the brick bond changing across the elevation to create a pattern based on the Fibonacci mathematical sequence. Areas of stack bonding with aligned vertical joints also reference the stacks of bricks that would have been on the site when it housed a brickworks in Victorian times. The main entrance is positioned under the sports beam to the north of the site, leading to a zone of specialist teaching areas with access from each key stage. These include drama/dinner hall, science, art and music. The dinner hall will have a first floor gallery to aid its secondary function as a studio theatre. Key stage 3 A and B are located side by side on the ground and first floors towards the south of the site. Each has classrooms at the perimeter and a common space that opens up onto a central courtyard. Positioned next to each other, these two gathering spaces can be used together for joint assemblies if needed. 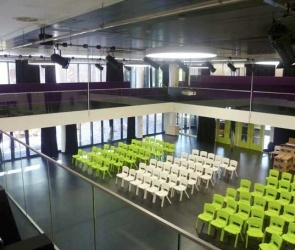 Key stages 4 and 5 are positioned on the second and third floors respectively, each with its own breakout space to supplement the limited external play areas. These external spaces permeate the plan of the main block and bring in natural daylight to as many rooms as possible. They include a key stage 4 court at second floor level, a central court, and to the north an art and design court and a rooftop science garden. These are supplemented by two large lightwells in key stage 3 inspired by Newton’s reflecting telescopes and conceived as translucent light prisms. A further lightwell is introduced over the main entrance through the sports beam. “We’re trying to make it as exciting as possible by introducing light in unexpected places,” says Theobald. The new building has a super-insulated, high-performance envelope to reduce energy demands. There is no wet heating system in the teaching spaces. Instead, classroom heating is provided predominantly from the occupants and equipment heat emissions, thanks to the high level of heat reclaim via individual class ventilation “ecoactive” units concealed within classroom bulkheads. Clad in metallic bronze anodised aluminium, the sports beam has a considerable impact on the immediately surrounding area and is the only part of the school visible from the nearby high street. Drawing inspiration from the concentric pattern of Newton’s rings, the architects used an overlay of perpendicular aluminium fins on the elevations notched along their length to create ring patterns, which change with different daylight and viewing angles. The underside of the beam is clad so that it appears as a metal box supported 6m above ground level. 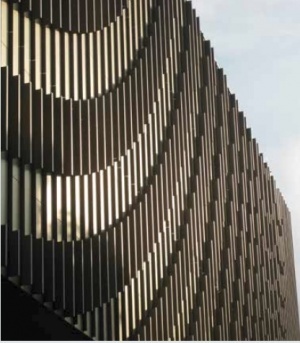 In all, 1,769m2 of metal cladding was used. The unusual loads of the 54m long, projecting sports beam made this a particularly challenging part of the design, with the engineers having to cater for potential rhythmic bouncing taking place in the sports halls while avoiding too many columns protruding into the public space below. The 18.7m wide beam is supported by five sets of paired columns, spaced 13.5m apart with the exception of the final pair, which is a double to allow for a fire escape staircase at the end of the sports beam. After initially positioning the columns on the outer edges, the design team decided to bring the first four inwards by 2.35m each side to reduce the span to 14m. This provides greater structural rigidity while preserving the visual effect of levity. Central columns were ruled out as they would have made the space on the ground less flexible. Columns are 305mm x 406mm sections and are encased in concrete. They are spanned by 16 beams, each 914mm deep. Walls are effectively giant two-storey trusses. At the main block end, a mezzanine administration floor is suspended from the four 1,600mm deep roof trusses spanning 19m. 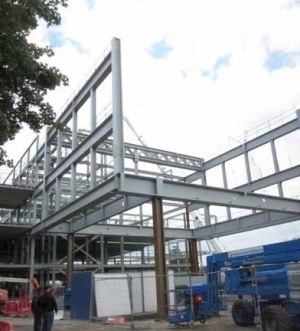 In order to minimise disruption to access to the sports club beyond the car park, steelwork contractor William Hare had to work quickly on site, using all-bolted connections with no in-situ welding. By using as simple connections as possible to speed up the erection, the steelwork for the beam was put up over the weekend, thus minimising disruption to the car park beneath. 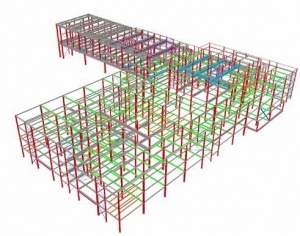 For steelwork contractor William Hare, one of the challenges was meeting the six-month ordering window for the steel beams, and then dealing with the tight site conditions during the installation – in some places the perimeter fence was just 2m away from the building. In total, 1,269 tonnes of steel frame is used on the structure, with nearly 2,000 pieces. On the main school building, asymmetric beams incorporate precast, 200mm thick concrete floor slabs, which sit on the wider bottom flange of the beam within the 300mm slab depth. Although the structure appears simple on plan, according to Skanska senior project leader Hardip Bansal there were several interesting aspects to accommodate. These included bridges linking the north and south blocks, large projecting box structures on the north and south blocks, and hanger supports to the balcony viewing areas in the north block as well as the third floor of the sports beam. Steelwork is protected with intumescent coating, where needed, to give four hours of fire protection – this was applied off-site.